(Note from the Editor) The use of the term HREBSD in this post needs clarification. The term High Resolution EBSD has had several different meanings since the advent of automated EBSD indexing. As indexing algorithms have improved it has referred to the improvement in angular precision of the orientation measurements. Others have used the term to refer to strategies for improving the spatial resolution of the technique. However, in recent years the term HREBSD is commonly being used to refer to the use of cross-correlation methods for precise calculation of elastic strains and small angle misorientations as pioneered by Angus Wilkinson (Wilkinson, A. J. (1996) Ultramicroscopy 62(4): 237-247.). It should be noted that in the results presented in this post, no cross-correlation calculations were performed, rather careful use of the standard Hough Transform and Triplet Indexing procedures were used. I recently saw an article on a social media site that showed how a particular telescope was able to look into the dark of space for a long stretch of time and see with impressive resolution thousands of galaxies. The image itself was quite amazing, but what was interesting to me was the comparison of the technique used to capture this image with that of what we call high resolution EBSD. High resolution EBSD (HREBSD) is a method within the framework of EBSD that seeks to extract improved angular resolution from an EBSD scan. The current angular resolution with standard EBSD is ~0.1o. This allows scans the ability to show plastic deformation within a sample which is caused by small measurable rotations of crystal lattices. HREBSD, however, has more than ten times the resolution of traditional EBSD methods at ~0.006o . This additional resolution allows measurement of additional materials characteristics including elastic strain and dislocation content. In order to obtain this information high quality EBSD patterns are required. Much as in the example of the telescope, high quality images/patterns generally require long collection times to get a high signal to noise ratio. Often frame averaging is suggested to reduce the noise in patterns. Long collection times per point often mean fewer points are collected in a given dataset. The issue is often ignored and lower resolution images are collected to save time or the technique is altogether neglected. When this happens the details that can be obtained from HREBSD are lost. With this blog post I hope to show the potential good data can offer to the extraction of high quality HREBSD results and also that with modern hardware high quality data can be collected much more quickly than previously thought. Figure 1: SiGe single crystal (left) and Ni standard used for EBSD calibration (right) IPF maps. The above inverse pole figure (IPF) maps seem relatively uninteresting, just a couple of colors. With high quality EBSD patterns we can start to see more details than the IPF maps show. 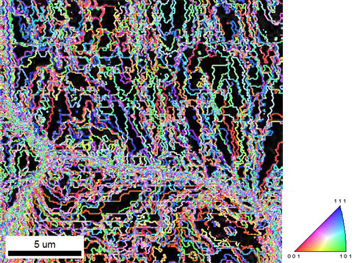 One of the basic metrics we use in EBSD to quantify and show deformation is the kernel average misorientation (KAM). This measurement shows plastic deformation based on local changes in orientation typically caused by dislocations. For the SiGe sample we wouldn’t expect much, if any, deformation. Small rotations can occur in SiGe though due to mismatch with the underlying Si substrate. One line of misorientation is faintly seen in the SiGe sample shown here. The KAM map of the Ni standard shows much more detail of the deformation that is present in the material. The structures that produce the deformation can clearly be seen as the higher intensity green, yellow lines. The Ni standard also shows pile up of deformation at the grain boundaries. While I can’t definitively state that the high intensity lines we see are dislocations, many researchers have used KAM to correlate with dislocation density and level of deformation. To obtain these values, the KAM of each map is charted and average values are used. Figure 2: KAM maps of SiGe and Ni standard. An arrow is shown to illustrate the deformation structure in SiGe which aligns with an edge of the overlaid crystal wireframe. Figure 3: KAM bar charts of SiGe and Ni standard. The x-axis on the SiGe sample goes up to 0.1o while the Ni standard x-axis extends to 1.0o. The average KAM for the SiGe is 0.0066o and for the Ni standard it is 0.11o. In the case of the Ni standard KAM chart there is a lightly distinguishable Gaussian shape running into the smallest misorientation angle bin. This is a result of the deformation structures in the material, whereas the SiGe chart is mostly strain free and thus all the misorientations are very small. The small KAM associated with the SiGe might be the real angular resolution of standard EBSD. Even if the angular resolution shown in the SiGe sample were to match that of HREBSD, there remain measurements that currently require the aid of HREBSD. As mentioned earlier in this post, HREBSD has the ability to extract the elastic strain of a sample and dislocation content, while standard EBSD only provides general information about the plastic strain. In addition to the KAM, grain reference orientation deviation (GROD) maps help illuminate some of the deformation in the samples studied. GROD maps show both misorientation angle and axis relative to the average orientation of a grain. This information helps show areas in the microstructure as they are partitioned by the deformation. The SiGe sample shows a diagonal trend of misorientation which is often due to extremely small variations in the pattern center calibration across a scan. (Pattern Center is used to properly index a material orientation). Figure 4: SiGe GROD-angle map (left) and GROD-axis map (right). The black area in the GROD-axis map is an area of zero misorientation and thus has no axis associated. The range of the GROD-angle map is 0-0.44o. Figure 5: Ni standard GROD-angle map (left) and GROD-axis map (right). Grain boundaries are drawn in black to distinguish the microstructure. The range of the GROD-angle map is 0-5.48o. One of the benefits of HREBSD is the ability to break deformation information into slip systems. With standard EBSD we currently measure the axes of rotation which are related but not the same. An example of the axes of misorientation is shown below. Each deformation structure lines up with a given axis of rotation. If the EBSD patterns are not of sufficient quality the axis measurement will be incorrect. Figure 6: Ni standard KAM map (grayscale) with misorientation axes overlaid. With the data collected and shown in this post, good quality HREBSD results are more likely, however the time required to collect such data can be overwhelming. In collecting HREBSD data it is important to ensure a high signal to noise ratio. This can be achieved by either longer exposure times with the EBSD camera or increased signal per time. In an SEM, increased signal per time is related to the amount of current going into the sample. For EBSD it is typical to use about 1 nA of current at 20 kV to collect data. These kinds of settings have resulted in collection times of less than one pattern per second for a full resolution EBSD pattern without using any frame averaging. Modern SEMs are capable of putting out >100 nA of current, much greater than the 1 nA typically used, and thus collection times can be greatly shortened. For this study ~50 nA was used to collect the data. In addition to the modern SEM capabilities the EDAX Hikari camera is able to run at 200 frames per second when using the full resolution of the camera. For this study the camera was run at 40 fps and a frame average of 8 was used, which resulted in a pattern collection time of 0.2 fps (5x faster than 1 fps an no frame averaging). With this speed the datasets of about 20,000 points were collected in about an hour. An example of one of the patterns used is shown below. 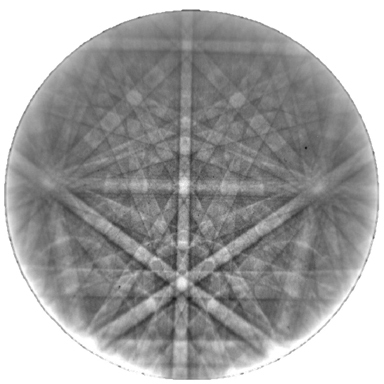 Figure 7: SiGe pattern used in high quality EBSD scan. The camera settings used to collect this pattern were an exposure of 25 ms and a frame averaging of 8 (Best Pattern setting in the TEAM™ software). ← TRANSMISSION-EBSD – Taking Transparency to a New Level. Please could you identify what reference  is? Hi Travis – good to see some EBSD blogging out there. Unfortunately I don’t think that anything in the article after the end of paragraph two makes much sense. Fundamentally, you can’t just count for longer to improve the signal with no limit (it helps, but there are limits due to how the analysis works). Good patterns are always a good thing, and encouraging users to make shiny EBSPs like you see in Figure 7 should be championed! There’s lots of info out there on HR-EBSD and the community seems to have a session at most of the major conferences. Very briefly – High (Angular) Resolution-EBSD fundamentally uses a different analysis (cross correlation of patterns) to the Hough transform to extract more information from the patterns and form maps of residual elastic strain, as well as local misorientation metrics. This is required to improve sensitivity, as well as accurately extracting the axis and angle of misorientation with small deviations between measured points. Britton, T.B., Jiang, J., Clough, R., Tarleton, E., Kirkland, A.I., Wilkinson, A.J. You use the phrase High Resolution EBSD or HR-EBSD in the title and throughout the piece but I don’t really see ANY HR-EBSD data in the example you show. I think of HR-EBSD as being the cross-correlation-based analysis that leads to the ~0.006 deg angular resolution you mention in the second paragraph. Is this what you mean by HR-EBSD or do you ave something else in mind? I apologize about the excluded reference. It was lost in the posting process and has now been corrected. Thank you for noting the omission. I apologize for the confusion. By using the terms High Resolution EBSD and HR-EBSD, I was indeed referring to the cross correlation techniques developed by Wilkinson, the reference to which was unfortunately lost in the posting process. For this informal blog, my goal was to collect high-quality EBSD patterns (high pixel resolution, low noise) that would be used for high quality HR-EBSD analysis. But I then only showed the standard EBSD analysis results, and tried to suggest not only that these results are better than generally expected by the EBSD community, but also that these patterns could be used by for HR-EBSD for improved results. I also wanted to show that it is possible to collect these types of patterns faster than is typically assumed, given enough beam current, to show that higher pixel resolution mapping can be done in reasonable timeframes. I should have been clearer on the difference between standard EBSD and HR-EBSD. Standard EBSD uses the Hough transform to detect Kikuchi bands and assigns orientation based on those detected bands. HR-EBSD uses cross correlation of the EBSD patterns to detect small shifts between patterns caused by strain. Thanks to Prof. Britton for the reference papers. I have looked at a couple of these and would encourage other readers to take a look, to gain a more detailed understanding of HR-EBSD and its benefits. In the lower part of figure 6, there are a high proportion of low angle boundaries that are horizontal and evenly spaced – any idea why? Are you seeing some sort of periodic shift / vibration? Re. “If the EBSD patterns are not of sufficient quality the axis measurement will be incorrect.” – EBSP quality isn’t the only issue. Dave Prior’s 1999 paper “Problems in determining the misorientation axes, for small angular misorientations, using electron backscatter diffraction in the SEM” (Journal of Microscopy 195 (3), 217-225) has more information. Is there any chance of a copy of the Nickel data set? It looks a good one for testing. Do you have the forescatter images of the same area? Any match between what them and the EBSD data? The horizontal boundaries (at least some on them) have been attributed to instability in the SEM at the time. In general it is well calibrated, but at the time of the scan the high current setting I used to collect the data had some problems. I would prefer to tell you something more exciting such as “like many others in the EBSD community this material was hesitant to initially trust HREBSD and decided to resist collection of patterns for use with HREBSD”. It makes a better story. It is definitely true that pattern quality is not the only thing which decides accurate orientation, but high quality patterns do help more precisely identify Kikuchi bands which in turn lead to better orientation assignment. The reference you provided is a good one as well as Bate et al 2005 which provides an analytical formula for axis error. According to the equation in the paper the accuracy will depend on both orientation precision and angle of boundary misorientation. You are definitely welcome to the data. I have already provided to a few others. I am looking to collect a newer dataset and can share that with you as well once I have collected it. I am curious to see what you could get out of it. I don’t have any hardware FSD images of the sample, but I could send you a PRIAS image which is just as good if not better. In one of the PRIAS images I looked at there were small intensity variations within the grains that appear to correlate to the deformation structures.